Giveaway Time is here, and if you have been reading my facebook posts, you know that i have reached over 350 GFC Followers. I see the number of hits i get a day and i feel greatful so many readers read my articles that i post. As a thank you, i wanted to give something back. 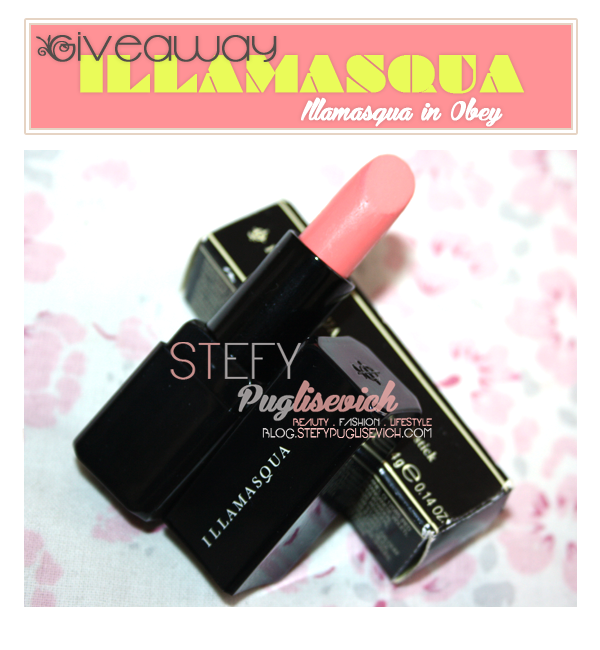 I am offering this High - End must have Illamasqua's Obey Lipstick. This is a Matte Lipstick a gorgeous Peachy lipstick perfect for Spring/Summer 2013! You will enter your chances to win Via Rafflecopter. Each Entry will give you more chances to win! The Winner will be Announced on the 22nd of April 2013, Giving you enough time to enter. I think concealer is the thing I cannot leave the house without. I can suffice without foundation, eyeliner and mascara. But concealer makes my face look naturally healthy and even. I always have to have a lip balm and lipstick. Usually, MAC Violetta. lipbalm or tinted gloss for sure! I can't leave home without mascara, gives your eyes a flirty pop! lately I can't leave the house without my pupa black eyeliner!